A tale of the recovery, loss and rediscovery of historic cannons from Johnsonville. In 2008, Mr Murray Henderson (1928-2008) of Johnsonville asked me to find out what happened to two cannons that once stood on the grass verge at Moorefield Road in Johnsonville and remained there until the road was re-engineered some time after World War II. Mr Henderson said the cannons had been recovered from a swamp at the bottom of Russell’s Road (also known as Russell’s Folly) and which were part of a wagon load of artillery that rolled and crashed to the bottom of the road. Research suggests this incident took place sometime between 1847 and 1854. This is because two cannon's from the Adelaide that may match the description are able to be traced from their arrival in New Zealand in 1840 to their transfer to Paremata Barracks at Porirua in and around the year 1847. After then, the trail of their location went cold. 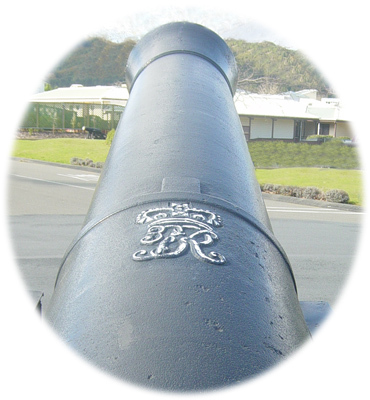 It is possible that the two cannon that rolled at Russell's Folly were being returned to Wellington after Paremata Barracks was scaled down. The next section in this article discusses Russell's Folly - Claire Bibby, Glenside.